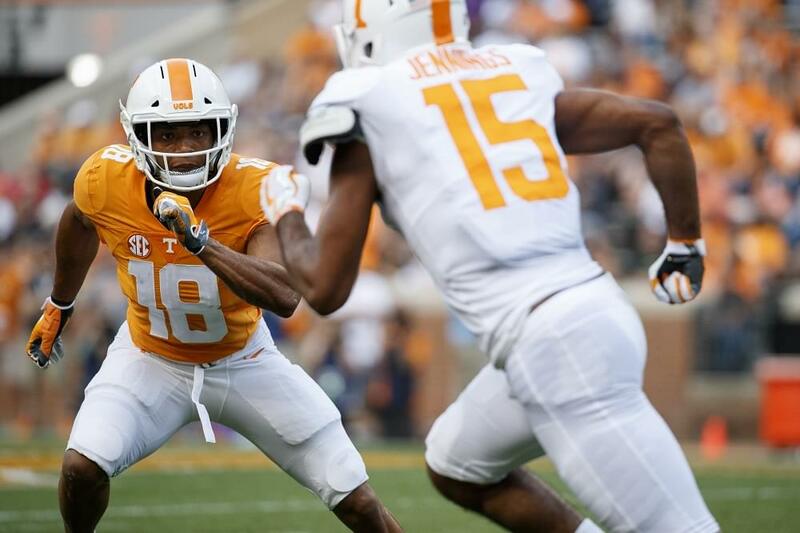 KNOXVILLE, Tenn. – Jeremy Pruitt earned his first win as a collegiate head coach in dominant fashion as the Tennessee Volunteers defeated in-state foe ETSU 59-3 Saturday evening at Neyland Stadium. Six Vols recorded the first touchdowns of their respective Tennessee careers in the win, led by running backs Jeremy Banks and Madre London with two rushing scores apiece. Josh Palmer entered the checkerboards on a 20-yard end-around rush, and Jordan Murphyhauled in a 50-yard touchdown pass to round out UT’s offensive touchdowns. Redshirt-sophomore quarterback Jarrett Guarantano led the passing attack for the Big Orange, connecting on 8-of-13 passes for 154 yards. Grad transfer QB Keller Chryst saw action for the second-straight week and completed all three of his passes for 70 yards and a touchdown. Sophomore RB Tim Jordan led all players in rushing with 65 yards in 15 attempts on the ground, while Marquez Callaway logged a game-high five catches and 78 yards through the air. Tennessee (1-1) scored its first touchdown at Neyland Stadium in 2018 on a blocked punt return by Osborne. Recovering his own block at the eight-yard line, the junior DB high-stepped into the endzone to put the Vols ahead 10-0 with 2:49 left in the opening frame. Kirkland Jr. made it a 31-0 lead for the Vols with his first-career pick-six on the next ETSU drive. The Indianapolis, Ind. native intercepted a pass at the 33-yard line, broke a tackle and sprinted into the endzone for UT’s second non-offensive touchdown of the day. Chryst fired the first touchdown of his UT career early in the fourth quarter, finding a wide-open Murphy down the sideline for a 50-yard scoring connection with 13:34 left in the game. London notched the final TD of the night on a four-yard rush with 3:20 remaining. The last scoring drive started following Micah Abernathy’s fumble recovery on a muffed punt. Junior newcomer Emmit Gooden led Tennessee with eight total tackles on the defensive line, including UT’s lone sack and a team-high three tackles for loss. In addition to his first-career interception, Thompson recorded two tackles for loss for the Volunteers. As a unit, the Vols held ETSU to 69 passing yards and limited the Buccaneers to 2-of-15 on third-down conversions. 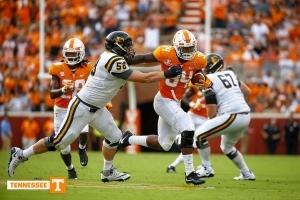 Tennessee returns to action next Saturday as the UTEP Miners visit Neyland Stadium. The game is set for a noon kickoff and will be broadcast on SEC Network.